Do seals have ears? Why do elephant seals only come to land twice a year? Which family of sea lions are the noisiest and smelliest? What do otters use their tales for? Harbour Seals are members of the Phocidae family and are one of the true seal species found off Victoriaʼs waters. True seals have pin holes in the sides of their heads for ears with no external ear flaps. They also have fur covering their flippers. Sea lions have small external ear flaps and naked flippers, thus they are not considered a true seal species. Harbour seals are one the most abundant marine mammals in the area. Their fur is typically silver with black spots, but variations of this colour scheme exist. Harbour Seals have barrel-shaped bodies with large eyes and long, straight whiskers. Despite their awkward attempts to move on land, they are very agile and fast swimmers. Unlike the dexterous sea lions, seals have short flippers, so they need to flop on their bellies when at shore instead of walking on their appendages. Males and females tend to be similar in size, reaching about 1.8m (6 feet) in length, and weighing up to 110kg or 250lbs. They can live for 20 to 30 years. Harbour Seals tend to be very quiet compared to their noisy island mates, the seal lions. They are an important food source for transient or mammal-eating orca. 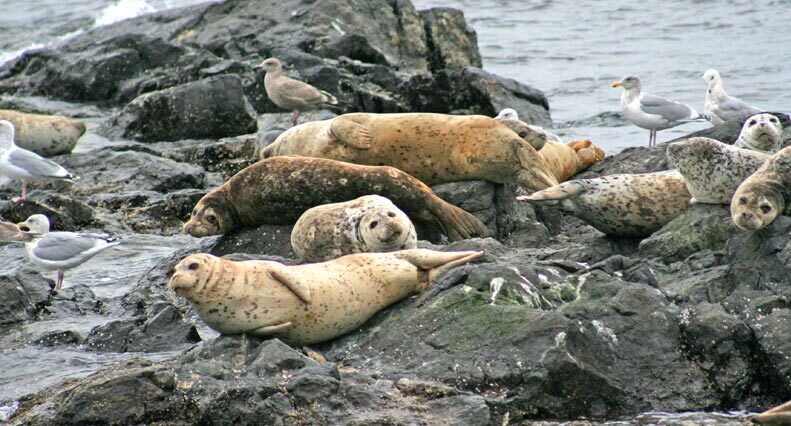 Harbour Seals can be found all along the North Pacific coast, with favourite haul-outs in the area at Race Rocks, Trial Island and Chain Islands. Because the waters are so cold here, the seals haul-out on the rocky shores at low tide to save energy trying to keep warm in the frigid waters. The seals give birth in June and July after a 9 month gestation period. A single pup is born on land where it will nurse from its mother for 3-4 weeks. Females will mate again immediately after her pup is weaned. Because a female is not at optimal health when mating occurs due to her latest pregnancy and nursing the pup, Harbour Seals have evolved a strategy called delayed implantation to help mothers cope with this situation. After a male and female copulate, the egg is fertilized by the sperm and stops developing at the one-cell stage. The implanation of the embryo is delayed for 1 to 3 months, giving the female time to regain fat stores before starting a new pregnancy. Once she has gained her fat stores back, her body releases hormones signaling the embryo to implant and the fetus begins to grow. Elephant Seals are not a common sight in the Strait of Juan de Fuca, but their presence is a real treat on a few occasions from spring until winter. Both males and females occasionally rest at Race Rocks Lighthouse, spending time basking in the sun atop the rocky islands. Northern Elephant Seals occupy Pacific waters from Alaska to Mexico. They come on land twice a year, once to mate and rear young, and once to molt. Mating occurs from December until March. Adult males and juveniles stick to northern ranges, while females prefer the warmer latitudes. Elephant Seals are a light brown, and true seals with no external ear flaps and fur- covered flippers. The males give the species its name, with their large elephant-like noses called a proboscis that can be inflated almost 1m or 2-3 feet. These are massive marine mammals, with males exceeding 2 tonnes (4,400lbs) and reaching 6m (20 feet) in length. Females are about half the size of males, at 1 tonne (2,200lbs) and stretching out 3m (10 feet). Just as astonishing as their size, Elephant Seals can dive to depths of over 1000m (3280 feet), and can hold their breath for up to 45 minutes. 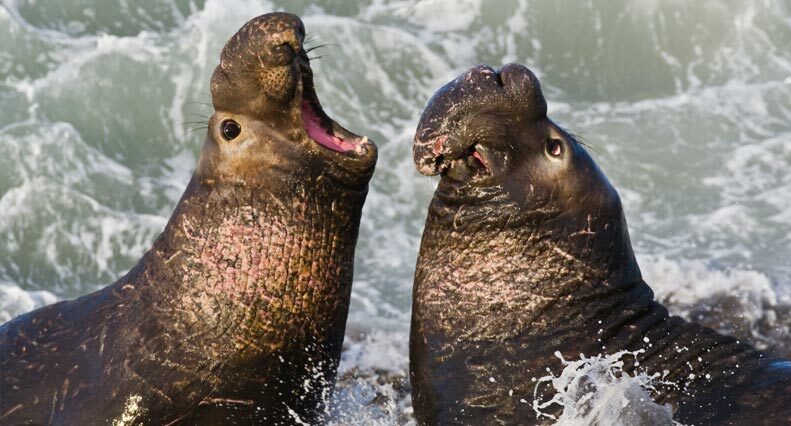 Elephant Seals were once heavily hunted, dwindling their population to approximately 100 individuals in the 1800ʼs. Thankfully their population has recovered to near historical levels with over 120,000 animals existing today. Like their relatives the Stellar Sea Lions, California Sea Lions also belong to the Otariidae family. They are a well-known species whose population extends from the Alaskan Panhandle to southern Mexico. They are most abundant from California to the southern tip of the Baja Peninsula. Females remain in locations off California and Mexico, while the males will venture further north to places like Race Rocks Lighthouse near Victoria. These intelligent animals are a chocolate brown colour with blonde faces. Like all other species of sea lions, they have external ear flaps and hairless flippers. Their large flippers can be rotated underneath their chest and rear, allowing them to walk very well on land. They are very acrobatic swimmers, twisting and turning elegantly below the surface. Their noisy and continuous barking can be heard over long distances on calm days. Because California Sea Lions have no fur on their flippers, they lose heat quickly in the cold waters of the Pacific. To lower the rate of heat loss through their flippers, they take turns holding one above the water at a time, a behavior called sharking. Due to the triangular shape of their flippers, they can look like shark fins when they hold them above the surface. California Sea Lions can make long dives, lasting up to 20 minutes. Their diet consists of herring, hake, pollock and some small salmon species. Males can weigh as much as 440kg (1000lbs), and reach lengths of 2.5m (8 feet). Females are much smaller than the males, only weighing up to 113kg (250lbs), and reaching 1.7m (5ʼ6ʼʼ) in length. Their populations are considered abundant, with some areas even experiencing population growth. Steller Sea Lions are some of the noisiest (never mind smelliest), marine mammals on our coastline. They are entertaining as they growl and roar as they challenge other males for space on the rocks. 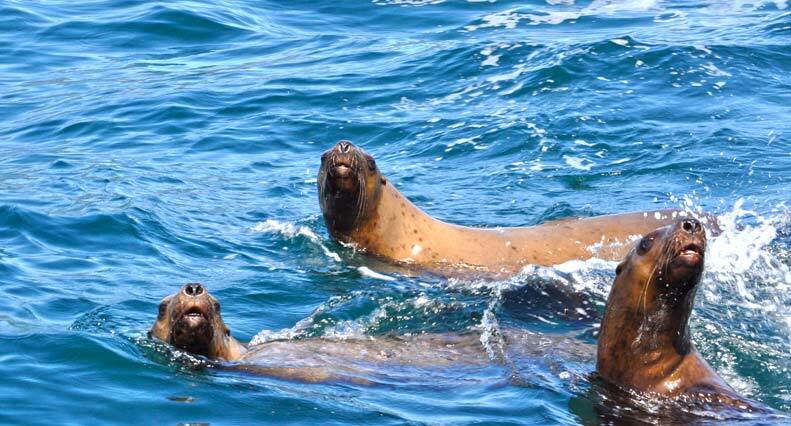 Steller Sea Lions are a honey-brown colour with large, dark brown flippers. The males have very thick necks that make them look like they have a lion’s mane, thus how they got their name. Because sea lions have large flippers fit with bones and joints, they are excellent at walking on land. The sea lions often occupy higher areas on the islands, leaving the water’s edge for Harbour Seals. Steller Sea Lions belong to the Otariidae family and are not true seals as they have external ear flaps and furless flippers. The sea lions are often seen sharking, a behavior where they hold their flippers above the cold water to absorb heat from the air and avoid the freezing temperatures of the sea. From a distance, the elevated flippers deceivingly look like the dorsal fin of a shark. Steller Sea Lions are the largest species of sea lion found in the Salish Sea, with males reaching one tonne (2500lbs), and stretching out to 3m or 10 feet. Females in comparison are much smaller, weighing as much as 270kg (600lbs), and reaching lengths of 2.5m or 8 feet. The skull of an adult male Steller Sea Lion can be larger than a grizzly bear’s. Males have an average lifespan of 20 years while females can reach 30 years of age. They are impressive divers, typically submerging for 2 minutes, but they have the capability to hold their breath for up to 16 minutes. Male Steller Sea Lions guard a harem of females in the breeding season. After mating is over, the males leave the females and head for bachelor islands. Some of these male-only islands include Race Rocks in the Strait of Juan de Fuca. Young males will join the adults later in the season. 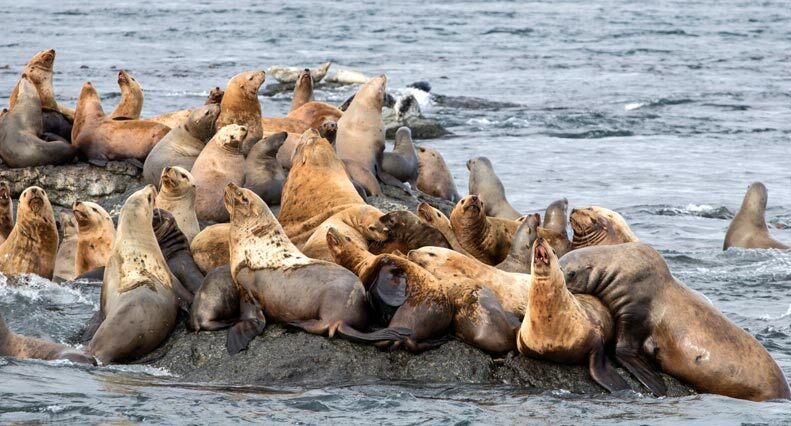 The North Pacific population of Steller Sea Lions extends from the Bering Sea to California. Due to over-fishing of their primary prey species, Pacific cod and herring, coupled with environmental pollution, the population of these marine mammals is plummeting at an alarming rate. Both Canadian and American agencies and organizations are conducting research and trying to implement protection initiatives to save the Steller Sea Lions from reaching dangerously low population levels. River Otters are members of the muskrat family and occupy both sea and freshwater habitats along the Pacific coast and throughout North America. They prefer to be near shore or inland waters, as they are more at home on land than they are in the water. 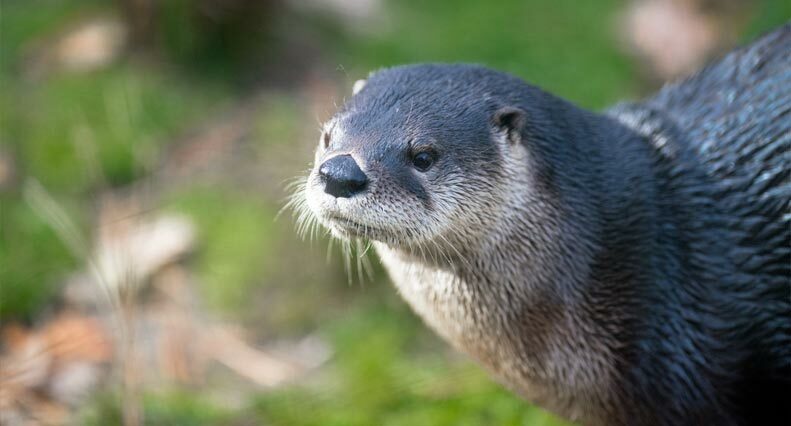 River Otters have long, slender bodies, with long tails that they use for steering while they swim. Their fur is dense for insulation and brown on the top of their body and white on their face, throat and belly. They can grow up to 1.3m (4ʼ6ʼʼ) long and weigh 13.5 kg (30 lbs). River Otters use hollow logs, roots, or old dens from beavers and muskrats as nests to raise their offspring. Pups live in the nest for 10 to 12 weeks before they venture into the water and learn to swim and hunt. The cuddly-looking Sea Otter is the smallest of all marine mammals. They can grow to over 1.5m (5 feet), and can weigh a healthy 36kg (80 pounds). They are true marine mammals, spending almost their entire lives in the water, even giving birth while at sea. 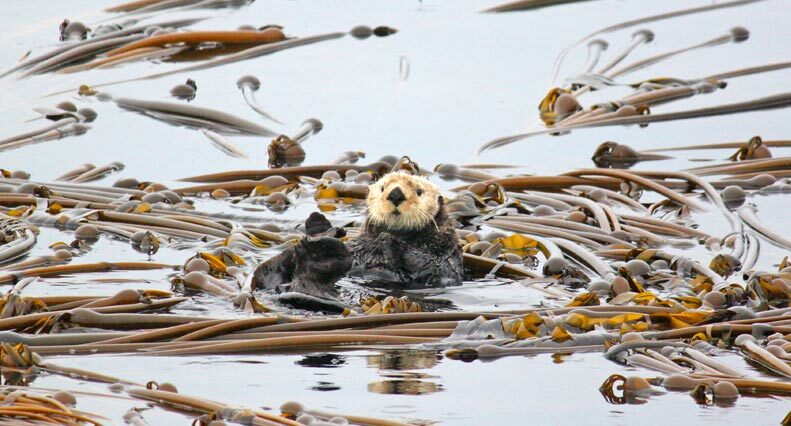 Because Sea Otters spend so much time in cold waters, they have a very dense layer of fur as opposed to a thick blubber layer like whales, sea lions and seals. Their fur is a mix of brown, black and blonde colours, and they have light coloured faces. Their large, triangle-shaped black nose and floating postures make them one of the most beloved animals in the sea. They are known to ʻhold pawsʻ to create floating rafts so that the community does not get separated. Sea Otters float on their backs to eat, using rocks and other hard items to crack sea urchins and abalone shells against. These furry creatures need to consume 30% of their body weight in food each day to maintain their high energy behaviors and to stay warm. Sea Otters were once hunted to near extinction for their dense fur. Less than 2000 were left worldwide, only 30 of those off Californian waters, and they were extirpated from the Canadian coast. A breeding and re-introduction program has proven successful, with several populations around Vancouver Island experiencing exponential growth. They have not spread down to Victoria yet, but we hope to see a healthy population here in the future.